After news that Native Americans were attacked by dogs and private security guards at the encampment against the Dakota Access Pipeline on Saturday, a series of support actions in solidarity with the Standing Rock Sioux Nation and those fighting the pipeline will be starting today through Friday this week in Sacramento. On Wednesday, September 7, there will be a picket at Citibank (1116 Alhambra Blvd, Sacramento, CA 95816) at 12:15 p.m. For more information, contact, Phillip Kim, California Labor for Bernie Sanders, phillipkim@gmail.com, 301-518-2631. 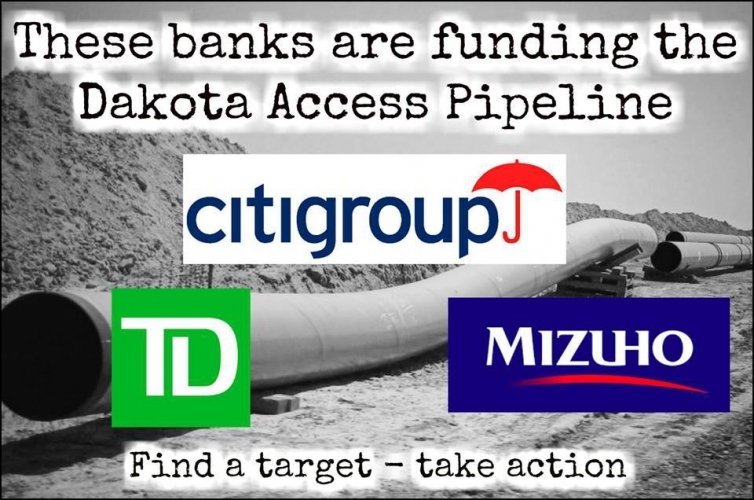 Citibank is being targeted because it is one of the financial institutions whose loans have funded the construction of the Dakota Access Pipeline. There are also 2 solidarity events scheduled on Friday: 11 a.m. at the Sacramento County Courthouse, 720 9th St.
12 p.m. at the U.S. Army Corps of Engineers office, 1325 J St.
On Sunday, September 4, the Standing Rock Sioux Tribe filed an emergency motion for a temporary restraining order (TRO) to “prevent further destruction of the Tribe’s sacred sites” by Dakota Access Pipeline (DAPL). The U.S. District judge denied the TRO as requested by the Tribe. Thousands of people from more than 200 Native Tribes have joined the Standing Rock Sioux’s efforts to protect their lands, waters and sacred sites from harm during construction of the 1,200-mile pipeline. The Yurok, Hoopa Valley, Winnemem Wintu and other Tribes from California and the Klamath Tribes of Oregon have passed resolutions in solidarity with the Standing Rock Sioux while tribal members have traveled to the camp to join the defenders. On Saturday, private security guards working for DAPL unleashed attack dogs on American Indian water protectors, drawing outrage from people throughout the country and world. After the initial destruction Saturday, Dakota Access Pipeline returned to the area and dug up additional grounds in the pre-dawn hours Sunday, Archambault said. The motion sought to prevent additional construction work on an area two miles west of North Dakota Highway 1806, and within 20 miles of Lake Oahe until a judge rules on the Tribe’s previous motion to stop construction, according to Archambault. That motion is based on the Standing Rock Sioux’s assertion that it was not properly consulted before the U.S. Army Corps of Engineers fast-tracked approval of the pipeline project. A decision on the case, filed in the U.S. District Court for the District of Columbia, is expected by Sept. 9. If built, the 1,200-mile pipeline would carry a half-million barrels of crude oil across the Tribe’s treaty lands each day, according to the Tribe. In a message on Tuesday, September 6, Chairman Archambault said, "Today, as we remain peaceful and prayerful, I feel we are turning the corner! As the injustices implemented on our indigenous rights and lands start to surface, eventually, this great nation will do the right thing and stop the pipeline from crossing our water!" As detailed in a report just released by Food & Water Watch, the Standing Rock Sioux are not just up against the oil and gas industry and the federal government. “They are up against the many of the most powerful financial and corporate interests on Wall Street, the profit-driven institutions that are bankrolling this pipeline plan and so many others like it throughout the country,” according to Jo Miles and Hugh MacMillan.